Glucose (C6H12O6) is a key diagnostic parameter for many metabolic disorders. Increased glucose levels have been associated with diabetes mellitus, hyperactivity of thyroid, pituitary and adrenal glands. Decreased levels are found in insulin secreting tumors, myxedema, hypopituitarism and hypoadrenalism. Simple, direct and high-throughput assays for measuring glucose concentrations find wide applications in research and drug discovery. 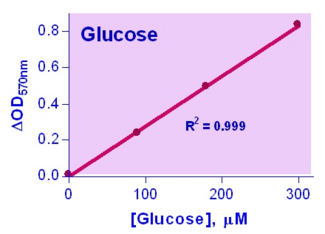 This glucose assay kit uses a single Working Reagent that combines the glucose oxidase reaction and color reaction in one step. 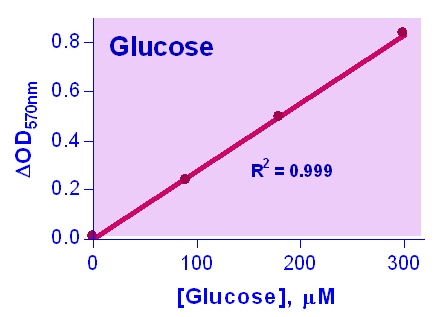 The color intensity of the reaction product at 570nm or fluorescence intensity at lambda ex/em = 530/585nm is directly proportional to glucose concentration in the sample.